The last four posts dealt with formulas for finding areas using lengths of sides, starting with the triangle, where that is all you need, and then quadrilaterals, where something more must be added; and then using coordinates of vertices. Now we can use those tools to solve some of the more common real-life problems we have received: finding the area of a plot of land. There will be several methods, depending on what data you have in addition to lengths. I have two areas of lawn that I want to sod with new grass, and I don't know how much sod to buy. One lawn is 14 yds wide at one end and 7 yds wide at the other end. The lengths are 16 yds and 20 yds. The other lawn is 30 yds long by 32 yds long by 5 yds wide by 10 yds wide. The sod comes in squares. I can easily cut the sod with a shovel. Let me try to better describe the lawn(s). If you draw on paper the following. Top of the lawn is 14 yds across. The bottom side is 7 yds across. The left side runs 16 yds and the right side runs 22 yds. On paper the diagonal from the top right corner down to the bottom left corner is approx 20 yds. From the top left corner down to the bottom right corner is approx 22 yds. On the other lawn, the top of the lawn is 10 yds across. The bottom side is 5 yds across. The left side runs 30 yds and the right side runs 32 yds. The diagonal from the top right corner down to the bottom left is approx 31 yds. From the top left corner down to the bottom right is approx 33 yds. Note that if diagonal BD is exactly 20 yards, AC is not exactly 22. Both were described as approximate, so this is the best we can do. The figure is “overspecified”, with a slight conflict among the numbers; but the fact that it comes out so close helps give confidence that the numbers are all reasonably accurate. We will find such confirmation useful in many problems of this type. Let's calculate the area, and after that we can calculate the number of squares. Then the area is:  Area = sqrt[s(s-a)(s-b)(s-c)] where sqrt[x] is the square root of x. So for your first lawn we will work on the top left triangle and then the lower right triangle. The top of the lawn is 14 yds (call that value 'a'). The left side runs 16 yds (call this value 'b'). The third side of the triangle is the diagonal. bottom left corner is approx 20 yds (call this 'c'). The bottom side is 7 yds across (call that 'a'). The right side runs 22 yds (call this 'b'). bottom left corner is approx 20 yds (this is 'c'). 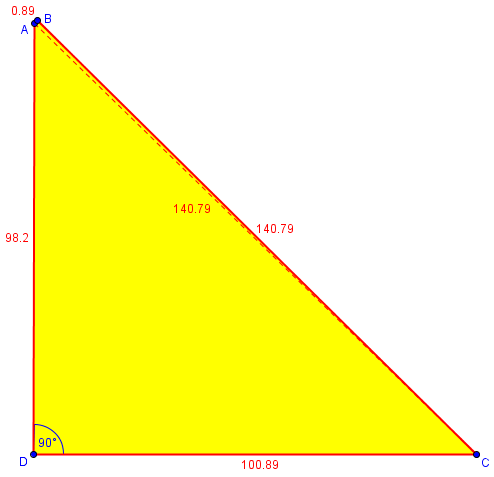 This means the total area of the lawn is the sum of the two triangular areas, a total of 180.69 square yards. If 1 square of sod is 1 square yard, then you need 181 squares of sod (because you can't buy 0.69 squares of sod). This differs from the other calculation by only 1 square yard, which is good. The other lawn would be done the same way. And in general the area of anything can be calculated if you can break it up into triangles. You have not given enough information to solve the problem. The best that I could tell you is that the area is *at most* 5016.35 square feet. In order to answer your question exactly, you will have to give at least one of the angles, or a diagonal distance, or some additional data. For example, are two of the sides parallel? Is the area convex? It turns out the maximum area occurs when the four corners of the lot lie on the circumference of a single circle. That's how I could compute the maximum area in your problem. I appreciate your taking the time to respond. I do have one 90-degree angle at the intersection of the sides that measure 98.20' x 100.89'. That one angle is enough (and, in fact, any configuration of these sides will come very close to a right angle there). Thanks for writing back to Ask Dr. Math, Gary. L = sqrt(98.20^2 + 100.89^2) = 140.79073... feet. which equals the maximum possible value 5016.35054787... to three decimal places (but not exactly). Feel free to write again if I can help further. If the one known angle had been something other than 90 degrees, we could use trigonometry to find the first triangle’s area and sides, so this illustrates a more general method. within the polygon (the "base line"). polygon from each end of the line. 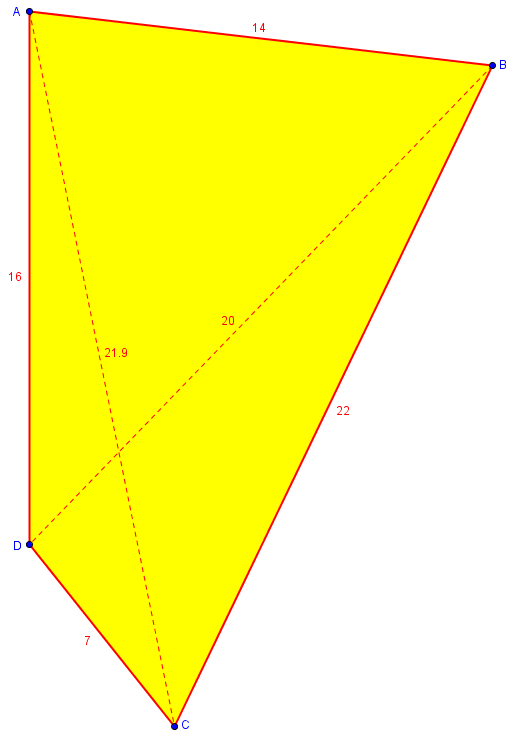 The resulting length of the single line and the angles supposedly contain sufficient information to compute the area. In trying to solve this I've been able to compute the areas of triangles that have as one of their sides the base line, and I've been able to solve some, but not all, of the other triangles. I'm stuck on a few peripheral triangles for which I can't seem to get enough information to solve. Is there a general algorithm to solve this problem for polygons of any number of sides; convex, concave, or when you do not have the lengths of any sides? If I can ever figure this out, I want to write a program to do the calculations. 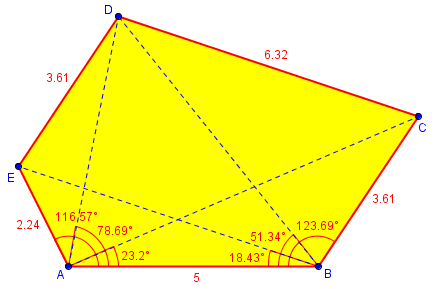 It's obvious that there is enough information in the angles and the baseline, because they are sufficient to draw the figure (using ASA repeatedly), and therefore the area is determined by these numbers. What you want to know, of course, is HOW? I'm not familiar with any traditional method used by surveyors, but I can at least come up with a method that will work. It takes two steps. You can check those; I did it pretty quickly, but it gives the idea. The cases where the tangents are 0 or infinite can be handled easily. I think that should be enough - maybe not as elegant as it could be, but pretty straightforward. We’ll look at one more type of input: the actual data surveyors put on what is called a plat map. I have a parcel of land that is a trapezoid. The four sides are not equal. The road frontage is 363.04 ft in a northeasterly direction. One side is 1950.16 ft in a southeasterly direction. The back is 338.49 ft in a southwesterly direction. The final side is 2000.75 ft in a northwesterly direction. The surveyor has determined it to be 624,630.88 square ft and 14.340 acres overall. The legal description is 15.8 acres. How can I figure out the square footage? Here we have four lengths, and general directions — close to what we need. You call this a trapezoid, but I suspect you do not mean that two sides are exactly parallel, or you would probably have said so. Without knowing at least one exact angle (better than "northeast"), I can't find the exact area. Do you know the bearing along each side? The square feet you give do convert to 14.340 acres; and 15.8 acres is very close to what you get by just multiplying the average "length" by the average "width," which may suggest that the area was originally found by a simplistic and inaccurate method, or it may be correct if the angles are just right. Please send me some angle data, and I can give you a better answer. Hope this helps; that's all the plat has on it. Since this was such a good example, I wrote up my work in detail for future use (and also made a spreadsheet that has seen a lot of use for this sort of question, and has been improved over the years). Now we can turn each side into a vector, indicating how far N and E it goes; the north component is L cos(A) where L is the length of the side and A is the angle from north, and the east component is L sin(A). For instance, to get from A to B, we go 285 feet north and 224 feet east. Now we call A (0, 0), and add up to find the coordinates of each point (which I wrote, for some reason, as north, y, followed by east, x). I included the location we get back to when we come to A, to check the accuracy of the calculations, and it looks pretty good. If the final coordinates were not close to zero, we would know some measurement was wrong, because the figure would not close. This is a benefit of having more information than the 5 or 6 facts we need for a quadrilateral. This, divided by 43560 ft^2 per acre, gives 14.34 acre. Not surprisingly, the surveyor appears to have used his own data correctly.